HMH Books for Young Readers, 9780152046866, 32pp. Hobo. Soldier. Reporter. Musician. Husband and father. Storyteller. Historian. Carl Sandburg was all of these things. But he distinguished himself above all as the Poet of the People, a traveler and dreamer who carried poems, stories, and songs in his heart--and shared them with the many people he met in his travels. 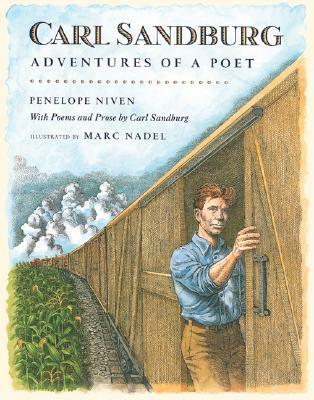 Seamlessly joining scenes from Sandburg's life, highlights from his poems and prose, and historically detailed illustrations, this thorough and thoughtful portrait turns biography into its own adventure. A time line and notes about the illustrations supplement the text. PENELOPE NIVEN (1939-2014) devoted fourteen years to organizing Carl Sandburg's papers, forming the framework for her 1991 biography of the poet. A fellow of American Literature from the National Endowment for the Humanities, Niven founded and directed the Carl Sandburg Oral History Project for the National Park Service and the University of Illinois Library. MARC NADEL (1950- ) has contributed illustrations to books as diverse as The Sesame Street Bedtime Storybook and The Art of Alfred Hitchcock. His illustrations for the Highlights for Children 24-book continuity Top Secret Adventures earned him the Distinguished Achievement Award for excellence in educational journalism from the Educational Press Association of America. He has also received the ONE Award from the Art Directors' Guild for editorial Cartooning.